I'll never forget the feedback a dean gave me a few years ago when he visited my (then) new A&P supplement course. The feedback was memorable because it seemed to miss the whole point (learning outcomes) of the course! Should A&P students always be quiet? I was very happy with the way that day's class went. 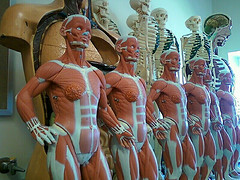 Meant to be an informal coaching and collaboration course to provide supplemental support for my human anatomy and physiology students, we had more fun than usual that day. Held in a teaching lab with about 22 students, we started with questions submitted on index cards as the students entered the room. They freely commented "Yeah!" to concerns about a topic being hard to understand. They piped up to give advice to the whole group about what worked for them. Then we moved on to an active learning session with students working collaboratively in small groups. But not quietly. At all. Some occasionally "shouted" a remark to another group. Once or twice members of one group talked across the aisle to another group about their progress or to get "unstuck" on a concept. And few shouted, "Kevin! We need you over here!" After that, we wrapped up with the usual "need for speed" activity where I'd put up slides of lab specimens—it was either bone markings or tissue types that day—and they'd have five or ten seconds to give the correct response with their clickers. A bit like a game show, my students are not shy about expressing their enthusiasm loudly. They groan when most of them get one wrong. They cheer when most of them get it right. They sometimes, yell out a "No way that's hyaline cartilage!" and we have a chance to work out the "differential diagnosis" in a way that helps them all get better at identifying tissue types. In fact, my students love the chaotic need-for-speed session so much that they complained that our class was just too short. So we eventually changed the schedule to give more time in class for this activity. That classroom-visit day was particularly chaotic and raucous. And I walked out on cloud nine, as did my students. How often does such enthusiastic and effective learning take place? So when I later met with my dean after the classroom visit, I was eager for his feedback. Being a fellow A&P teacher himself, known for his informal and playful approach to both teaching and college administration, I thought he'd have enjoyed the experience. And he did. But he expressed concern about the potential of the class being "so close" to getting "out of control." Yikes. The aspect of the class that I had thought went particularly well, was seen by him as a cause for concern. And this guy is a bright, insightful educator who is usually very constructive in any criticism he gives. Being the self-analytical dude that I am, I spent many months thinking about this. I even discussed it with teaching colleagues and former students—was I doing it all wrong? I (and others) eventually concluded that my dean wasn't fully appreciating the "big picture" of what was really going on that day—the way he usually does. As a former lion tamer who presided over many raucous—but highly productive—training sessions, I can appreciate that anyone "outside the pride" may not understand what they are witnessing. It easily could seem more like a dangerous, chaotic, mess than a particularly wonderful day inside the lion den. They don't know the personalities of the animals (and people) involved, how their comfortable (and loud) relationship developed, and how the loudness was an indicator of enthusiasm rather than distraction (or menace). So I was particularly heartened to read a blog post from the Center for Teaching Quality today on this very topic—learning is loud. Have a read yourself and see if there's anything you can glean from it that may fit your own teaching style—or that may want to make part of your teaching style. There are some other related resources listed below, too! J. Keigan. Center for Teaching Quality-Teaching in the Present Tense. 20 Sep 2015. Blog post that explores the value of loudness in pre-college classrooms has lessons for college teachers, too. It was this post that dredged up the memory described above. When Is a Good Day Teaching a Bad Thing? Brief article that contrasts the "hidden contract" of students keeping quiet may be at odds with successful teaching and learning. Brief article that explores the idea the many classrooms do not resemble what we know about how people learn best. K. Patton. The A&P Professor. Accessed 24 Sep 2015. Want to know more about the A&P Supplement course I referred to in this post? This online presentation explores a case study outline the use of supplemental courses to helps student prepare effectively for their first A&P course, and to improve their learning skills as they begin their first A&P course.